Horizontal form fill seal and trim machinery designed to run: blister packs, portion packs, medical trays, unit dose packs, etc. 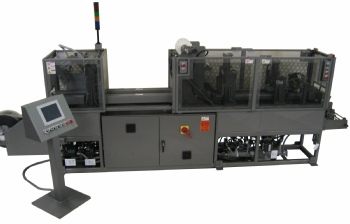 Automatic form/fill/seal & trim types of inline packaging machinery can be either manually loaded with products from both sides of the machine, or integrated with automatic loading of products with the form fill seal machinery. OPERATION: Roll-fed thermoplastic material is indexed into the machine, where it is heated and shaped by forming tools. The formed parts are automatically indexed to the product loading area, then advanced where lidding is placed on the top of the formed tray. It is then indexed to a heat seal station. The sealed package is then indexed to a trim station. Steel rule dies are used to die cut into individual packages. The parts are deposited on a take-off conveyor and the scrap web is rewound. Sequences are PLC controlled. Contact us to discuss your application and for pricing.